Giant tiger lower prices, absolutely! 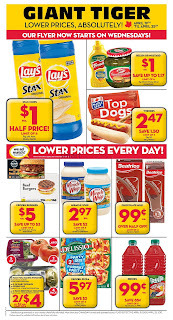 April 19th til April 25th Our flyer now starts on Wednesdays Stax Chips half price $1 ea limit of 6, Relish or mustard price $1 ea save up to 1.17 limit of 6, Wieners $2.47 save $1.50. We ad match Guaranteed, Lower prices every day! Drinks prices 99c save 85c limit of 5. 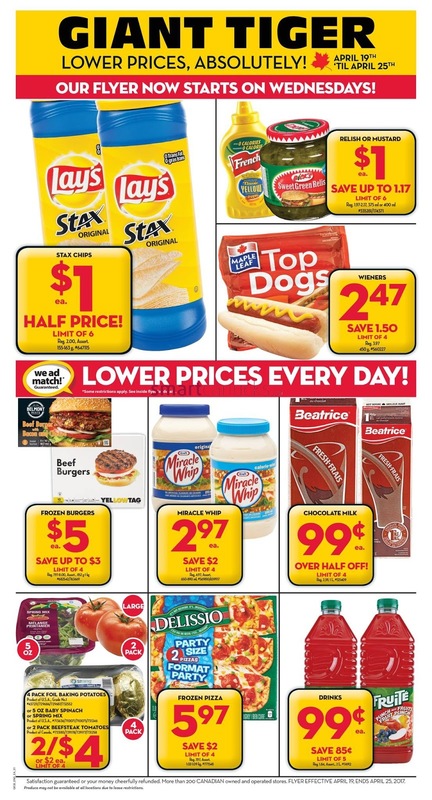 Frozen dinners price $2 save 48cm frozen entrees $5 save 98c, Ravioli $6.97 save $2, Hash browns $3 ea save $1, Cereal prices 2.97 ea save up to $2, Orange juice prices 3.98 save $2, Single serve cofee 4.47 save 1.50, bread 2/$4 or $2 ea and more you can cheks on page 2.